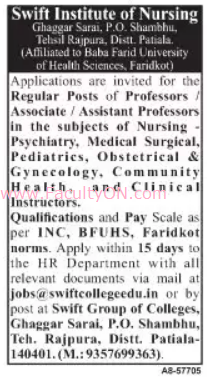 Swift Institute of Nursing, Patiala has advertised for recruitment of Teaching Faculty- Professor / Associate Professor / Assistant Professor jobs vacancies. Interested and eligible job aspirants are requested to apply within 15 days from 27th November 2018. Check out further more details below. About College: Swift Institute of Nursing is situated at Ghaggar Sarai, Seven Km from Gagan Chowk, Rajpura towards Ambala Side. This proposed Institute is being introduced by the Swift Fundamental Research & Education Society (SFRES). The institute offers Diploma in General Nursing Midwifery (G.N.M.) and degree in nursing (B.Sc. Nursing), B.Sc. Nursing (Post Basic) & M.Sc. Nursing. How to Apply: Interested and eligible candidates are requested to send detailed resume along with copies of certificates, PAN card, Aadhaar card and PP size photos to the email or postal address given below.